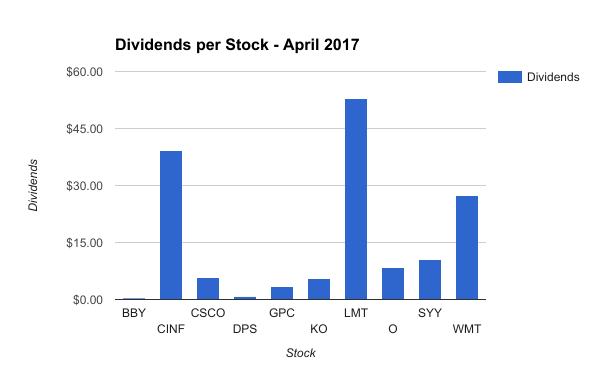 We are now into the second quarter of 2017, and once again it is time to post our latest dividend income results for April. 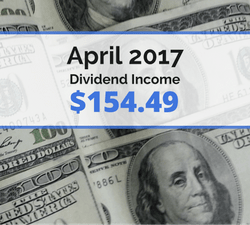 It was another great month and a new record for April dividend income … which is really no surprise. We have been focusing on investing new funds into dividend stocks for over a year now, so it would be a disappointment if our income doesn’t rise. Overall, we continued to see solid growth from new investments, several dividend increases, and dividend reinvestment’s. All of our new investments (and reinvestment’s) will eventually grow and compound. Future dividend income growth will rely on these new investments we are making now. This past month, we really boosted our future dividend income by investing the majority of our tax refund. These types of large investments ($4,000+) can really help to accelerate your future dividend income. We set another record for April dividends. Not a big surprise … but something we should celebrate just the same. All of those investments from last year (over $10,000) are really starting to pay off! And the $13,000+ that we invested into dividend stocks in 2015. Let’s not forget the $8,000+ we invested in 2014 either! Each year, month, and day that goes by … these investments from past years are growing and compounding and getting bigger and bigger. That is why we are so focused on investing $20,000 before the end of 2017. Years from now, we will see all this hard work pay off, just like we are seeing the awesome returns from work put in 3 or 4 years ago. We saw an increase of over 17.5% last month compared to April 2016! This latest increase of close to 20% is consistent with past months and shows all the new capital we have invested into the market is working hard. Overall, we had 10 stocks pay out a dividend in April. Great companies like Cisco, Coca-Cola, and Genuine Parts gave our family a paycheck for not really doing much at all. How awesome is that? Note – All of the dividends we currently receive are reinvested into new shares of the same stock using DRiP – except those purchased through our Robinhood accounts. So far in 2017, we hadn’t been investing as much as we would have liked. Our goal was to invest over $1,400 per month of our income into dividend stocks. Unfortunately, we were only averaging about half of that. Back in November, we set a goal to grow our forward annual dividend income to $3,000 by the end of 2017. In order to reach that goal, we would need to average around $1,400 a month, so we have a ton of work to do. Fortunately in April, we caught up in a big way by investing over $4,000 of our tax refund. Note – All of these investments were made through our Robinhood, LOYAL3, and transfer agent (CINF) accounts … which means we did not pay any commissions or fees on these trades. Note – We also sold off very small partial shares in AAPL, BBY, and TGT that were held in our LOYAL3 account. The net of the sales + purchases for these stocks is represented above in “new investments”. Also, we closed out entire positions for – Kellogg (K), Kraft Heinz (KHC), Dr Pepper Snapple (DPS), and VFC Corp (VFC). Note – A majority of the new investments for April were a result of investing our tax refund. 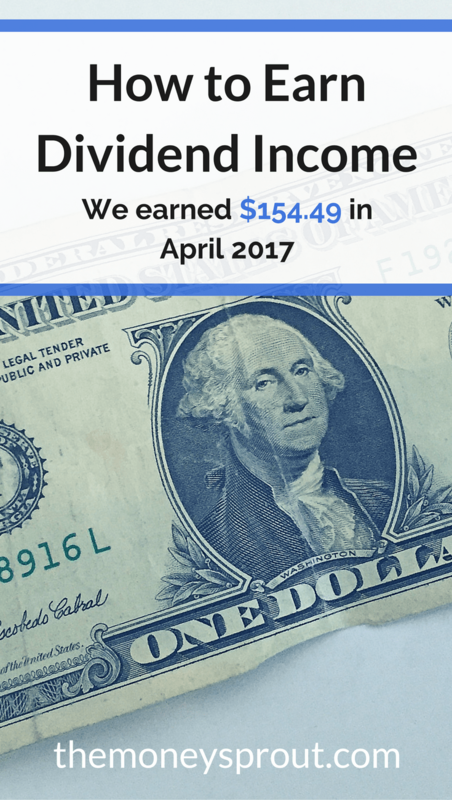 The dividend income earned in April ($154.49) was up over 17% from the same time last year. These increases were from a combination of new investments made, dividend reinvestment’s, and company dividend increases. Speaking about company dividend increases – we got a couple this past month – Omega Healthcare (OHI) 1.6% and Procter & Gamble (PG) 2.5%. We have earned a total of $710.63 in dividends for 2017 … which means we need to earn around $1,690 the remainder of the year. That is an average of $210 per month. Unlike last year, I think reaching that goal will be challenging but possible. We set an unrealistic goal in 2016 and didn’t come close to reaching it. Provided we keep up with our new investments, I think reaching our 2017 dividend income goals can be attained. And if they are, we will be well on our way to reaching a goal of $3,000 in dividend income for 2018! 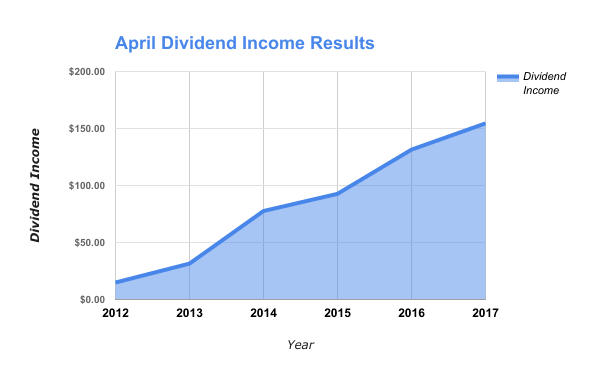 How was your dividend income in April? Full Disclosure – At the time of this writing, we owned shares in the following stocks noted in this post – AAPL, AFL, BBY, CINF, CSCO, INTC, JNJ, KO, MCD, MSFT, O, UL, and WMT. The material above is not a recommendation to buy. Please do your own research on a company before deciding to invest.